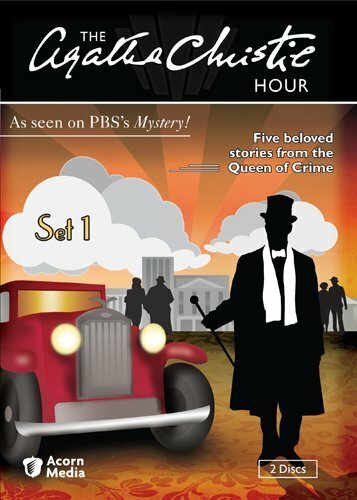 And while the bestselling female crime writer is perhaps best known to Christie fans as one of Hercule Poirot’s most consistently advantageous clue-seeking friend, Ariadne Oliver originally got her start as a woman whose flair for the dramatic was often sought out by “happiness expert” Parker Pyne in Christie’s Pyne series of stories and novels. Adamant about his belief that unhappiness can be easily classified under five main headings which Pyne is willing to tackle largely by allowing his clients to have an adventure worthy of the stuff of Oliver’s fiction (and ultimately Agatha Christie’s own work as well), actor Maurice Denham is charmingly manipulative as Parker Pyne in two of this Acorn Media release’s five episodes culled from 1982’s short lived Thames Television presentation. Reassuring prospective customers that he can guarantee a cure if he decides to undertake their case, Parker Pyne and his well-trained cast of leading men, women and bit players wander into the lives of the client to shake things up in an elaborate production whether it’s helping a middle-aged housewife get even with the husband who’s been taking her for granted or providing excitement for a recently retired and thoroughly restless army major. Yet as delightful as the Pyne tales are as mildly escapist fare that in their way feels like a milder, geriatric-friendly version of the David Fincher movie The Game, the remaining three mysterious escapades that play out in just under an hour are far more fascinating. This is evidenced in a playful pre-screwball romp wherein a just fired man spontaneously boards a train only to land smack dab into The Spanish Prisoner reminiscent intrigue as a beguiling woman implores him to hide her in his compartment, protect a small brown-paper wrapped package and follow a fellow passenger. Furthermore, given two more engrossing tales that show Christie’s more psychologically curious, gothic side, the set is well worth exploring to investigate her diverse prolific output. Likewise, devotees of Acorn Media’s perennial favorite series Midsomer Murders won’t want to miss actor John Nettles’ appearance as a key player in the conversational, flashback heavy aptly titled fourth episode, “The Fourth Man.” However, despite one pretty predictable twist, you should actively seek out the set’s irresistible Bronte-esque standout “In a Glass Darkly,” as a young man sees a vision of a woman he’s never met being strangled by a man with a distinctive scar. When he meets the woman from her vision and realizes that she’s engaged to the scarred man from his mirror vision, he must decide whether or not he can tell her and additionally regardless of the information, if it will have any impact on her fate. Chilling and smart, similar to “The Fourth Man” in its more gothic tone, “In a Glass Darkly,” is an instant classic that you can see inspiring writers and filmmakers to this day, thereby making the Acorn release that much more beneficial since Christie’s fiction is not only timeless but gripping enough to be imitated in the artistic side of life for generations to come. While comparatively speaking, the set may not stand up as well as the new exquisite adaptations of the Marple and Poirot books that air on PBS as those novels are far richer and more complex than the playful psychologist replacement Pyne, it nonetheless made me curious to delve further into Christie's bibliography to see what wondrous characters await there that I haven’t previously encountered.